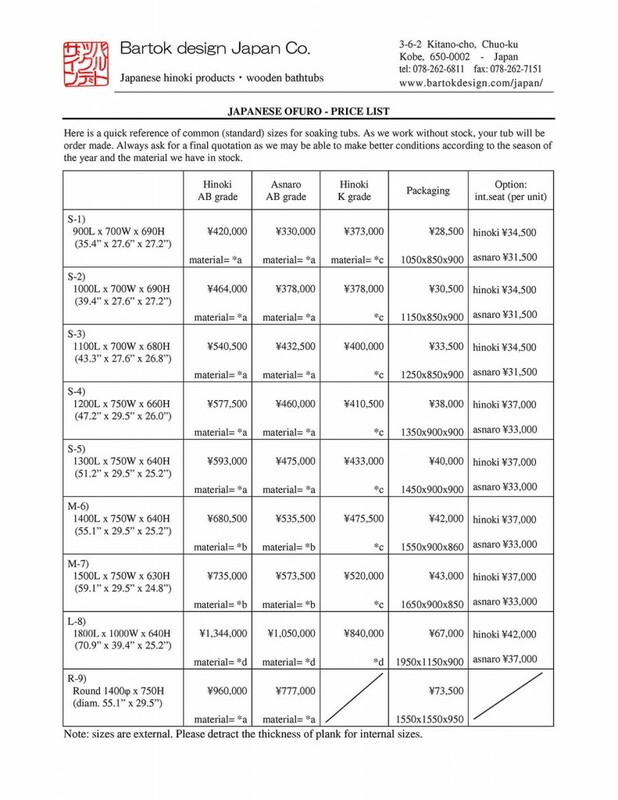 ofuro price list | Bartok design Co. ofuro price list – Bartok design Co.
Our policy is to produce custom ofuros freshly after your order. This way we do not have to use a lot of space to store the stock and do not have to immobilize capital for ready-to-ship products. The customer`s advantage is a reasonable price, maker-to-client and the possibility to adapt the tub to your needs and bathroom sizes, up to the milllimeter! For this reason, feel free to ask us a custom quotation. We are at your disposal! This said, If you just want to have a quick reference or compare with standard sizes of different makers, please refer to the chart below. Again, this is just for reference, always ask for a final quotation as we may be able to make better conditions according to the season of the year and the material we have in stock. Click on the image below to download the pdf version.